Couponing Momma Giveaways & Reviews: FREE Stamps at Cardstore! Yay for Summer! What special occasions are you celebrating this season? Perhaps you're celebrating your son's 3rd birthday or attending the wedding of your favorite niece. Need some cards for these fun celebrations? Well, Cardstore can help! Now through Sunday 7/20/14, create all the personalized cards you want, and Cardstore will mail them to your recipients for FREE! And even better, you can get organized and schedule cards for up 1 year in advance with their easy-to-use Future Send tool. Simply select your card, personalize it with your recipient's name, load photos from your computer, Facebook, practically anywhere you store them, then decide when you want the card sent to your recipient. 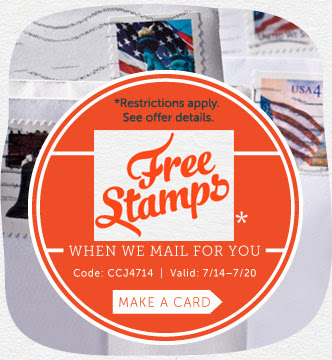 Create All the Cards You Want & Receive FREE Stamps When We Mail it for You at Cardstore! Use Code: CCJ4714, Valid through 7/20/14. So, start making your personalized cards today at Cardstore!